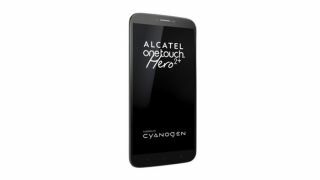 At MWC 2015 today French company Alcatel announced the OneTouch Hero 2+, a phone loaded with Cyanogen OS 11 that's headed to the US. Cyanogen, as you may know, is the company that wants to wrest control of Android away from Google, and the Alcatel OneTouch Hero 2+ will be only the third phone to come with native support for Cyanogen OS (after the OnePlus One and the Micromax Yureka), reports Android Authority. But besides the OS change, the OneTouch Hero 2+ strongly resembles the OneTouch Hero 2, unsurprisingly. And in this case "resembles" means "is completely identical to," including the 6-inch display, octa-core processor, 2GB of memory, 13- and 5-megapixel cameras, and a built-in stylus. The Alcatel OneTouch Hero 2+ is scheduled to launch in the second quarter of this year for only $300 (about £200, AU$385).